I have a picture of my son (who was a few months old), my dad, my G-Daddy, and myself. It's a special treasure. We were four generations 25 years apart — 0, 25, 50, and 75 years old. Everything would change just a few months later. After ten years of battling "asthma after 40," my dad died just a few weeks past his 51st birthday. A few years later, my dad's father, whom we called G-Daddy, died. (My other grandfather, Daddy Gordon, had died many years earlier, shortly before I turned 6.) Before I was 30, all the older men in my life were gone. I was left with the unstated but deeply imprinted feeling that my life would be short. I lived driven by the sense that I needed to "go fast"! I needed to "go fast" if I was going to wring from life all that was meant for me. As I approached 51, I began to realize this unstated assumption — this destructive driven-ness. I realized I had rushed so many things to "go fast"! I had experienced many things, yet seldom paused to enjoy the nectar from so many of my blessings. By God's grace, I am now 60. This past decade has not always been easy, but it has been rich and full of people and experiences from all over the world. Most of all, these years have deepened my appreciation for the men who are gone from me physically, but whose passions and faith are deeply imprinted in me. My hobbies have drifted into the things that have connected me with them. I have repeated many of their pithy sayings in my writing and in my preaching. Most of all, I have tried to live, as they did, for my grandchildren (physical and spiritual grandchildren) to have faith. When I was a little boy in Conroe, Texas, my dad and I had a special place to enjoy boyhood. My dad had built his first real car from parts at the wrecking yard and a powerful but discarded Mercury V8 bus engine. He was literally a closet gearhead. So across the carport and behind a locked door in a storage closet, my dad had set up a model car heaven. He taught me to chop-and-block a roadster out of model parts. We meticulously hand painted everything. Every detail had to be perfect. We had a yellow '57 Chevy like my grandmother drove too fast. We had a Willys Coupe. We had NASCAR models. Then we began our Indy series. We built Indy cars like A. J. Foyt drove. We had Parnelli Jones racers. We even built the STP turbine, which my dad considered a blasphemous aberration for Indy racing — duly humbled by the breakdown at the end of the race so that the rightful Indy hero, A.J. Foyt, could win the race at the end. 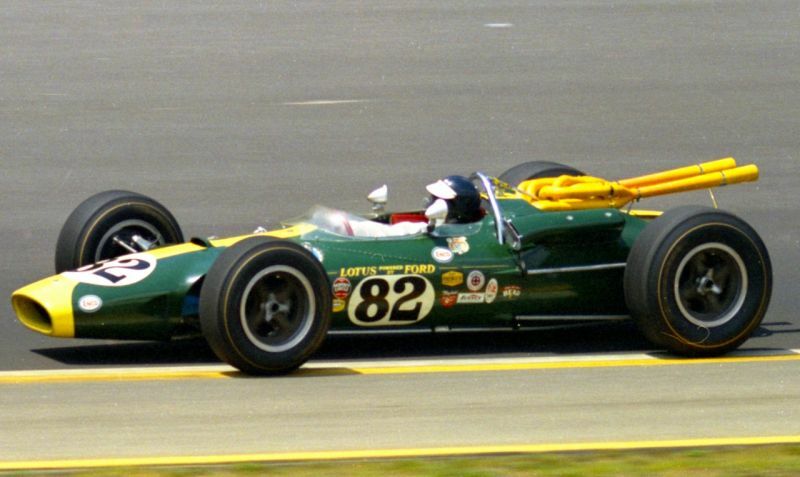 The first car Daddy Al helped me build was a copy of Jim Clark's green and yellow Lotus Ford — see the image at the top of this post. Clark was arguably the greatest racer in the world at that time. He was also one of the few drivers willing to brave the green car curse at Indy. I am not sure what ever happened to that model so meticulously built, but it lives in my heart. I never got to go to an Indy 500 with my dad. Maybe one of these days I can go with my brothers in honor of our dad. However, my precious wife and kids surprised me with something two years ago at Christmas that reconnected me to this part of my dad's legacy. 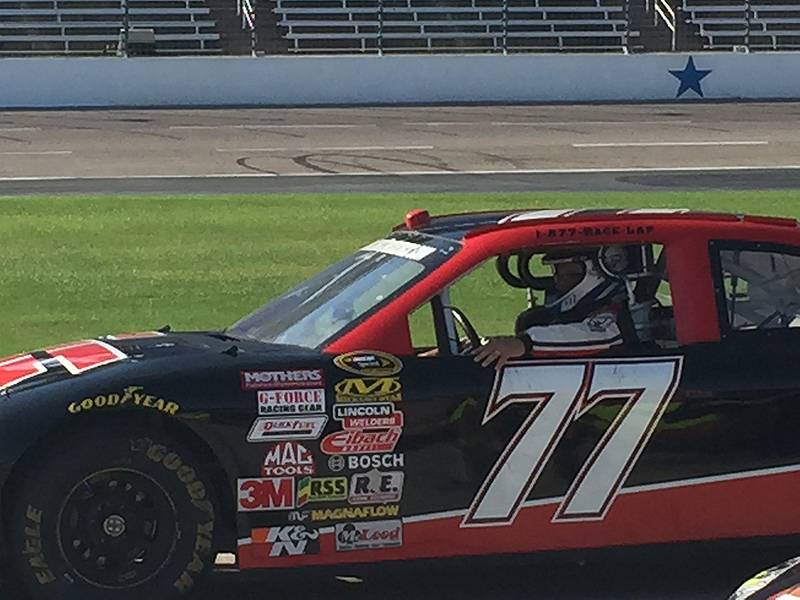 They bought me 8 minutes of drive time at Texas Motor Speedway in a NASCAR race car. This past Saturday, at the age of 60, I showed up with a few guys my age and a bunch of young bucks. I finally was going to get to redeem my 8 minutes. As soon as I opened the door of my red Camaro on pit lane, the connection with my dad was palpable. The roar of engines reminded me of trips to the dirt track with him. I remembered Sunday afternoons watching NASCAR and the yearly Indy 500 tape delay. The sounds and smells of the track took me back and connected me to my dad who has been gone now for 35 years. I didn't want to embarrass myself. I didn't want to dishonor my connection with my dad. I know that may seem overstated, but I assure you it isn't. At the age of 12, he had let me drive the '59 Ford Fairlane 500 and go 95 mph. I couldn't disappoint him now that I was getting to do something he had longed to do. Plus, I didn't want to embarrass myself. Yeah, I'm sometimes an old dude with too much pride. After our instruction time, I had to wait and wait and wait for my turn. I saw guys go fast — close to 150 mph, about as fast these chipset cars would go. Only one walked away with a 150 mph club t-shirt. I hadn't driven a four-speed in a long time. "Just don't kill it coming off of pit road," I thought to myself. I didn't and gradually came up to speed on the apron going through turns 1 and 2. Coming out of turn 2, I was told to blend from the apron to the real racetrack. Then I punched it into turn 3 and turn 4. I felt the g-force in the corner. I relaxed my hands on the wheel and was suddenly lost in the speed, the rumble of the engine, and the desire to find the perfect line in the track. In a few laps, I was allowed to pass one car, then another. When I got to lap six on my 8-minute run, I realized I must have done pretty well. On lap 7, I coasted into pit road as a little boy exhilarated at the fun and the conviction his dad would be pleased. My NASCAR Experience was a blast. I spent 8 minutes absorbed in a world of fast, fun, and family. Did I "go fast"? Yeah, the speed was great — 155.46 mph. But the experience of sharing in this gift of generations — Daddy Al, precious Donna (my wife), Zach and Mandy (son and daughter-in-law), Megan (daughter), and Shaun and Jonathan (grandsons) — was the most precious part of it all. This was a gift of grace and generations, not just of speed! For I have chosen him, so that he will direct his children and his household after him to keep the way of the Lord by doing what is right and just, so that the Lord will bring about for Abraham what he has promised him (Genesis 18:19). Whether the Lord gives me many more years to pass on my faith or just a few, I'm thankful for every single day. I want my grandchildren to love the outdoors. I want them to relish the beauty of God's creation and his creatures. More importantly, I pray that I can help my grandchildren pass on their faith to their children and grandchildren and that life will "go fast" so they need to make each moment count. I want our chain of grace to be unbroken from generation to generation until we all sit at the feet of our Father in a glory that won't ever end — a glory that earth cannot provide. I want this chain of grace to last and not just "go fast"! This is a picture of a friend, Mark Hanner, and his grandson. Mark also goes by G-Daddy and I immediately thought of this Scripture when I saw the picture. 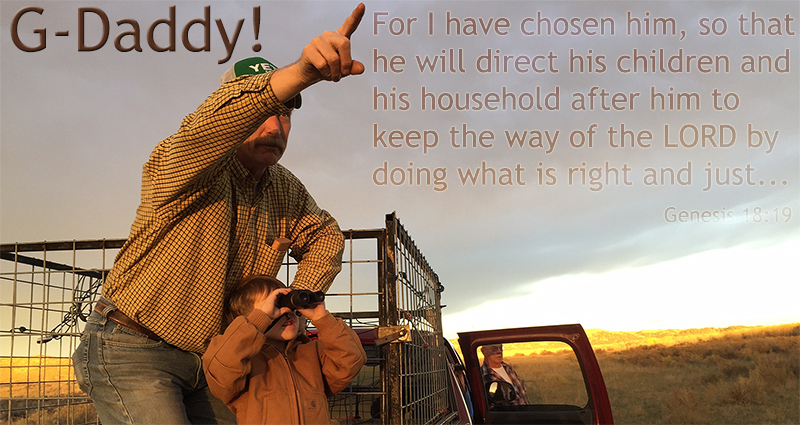 Mark shares my commitment to live for our grandchildren to pass on faith. "Go Fast!" by Phil Ware is licensed under a Creative Commons License. Heartlight encourages you to share this material with others in church bulletins, personal emails, and other non-commercial uses. Please see our Usage Guidelines for more information.